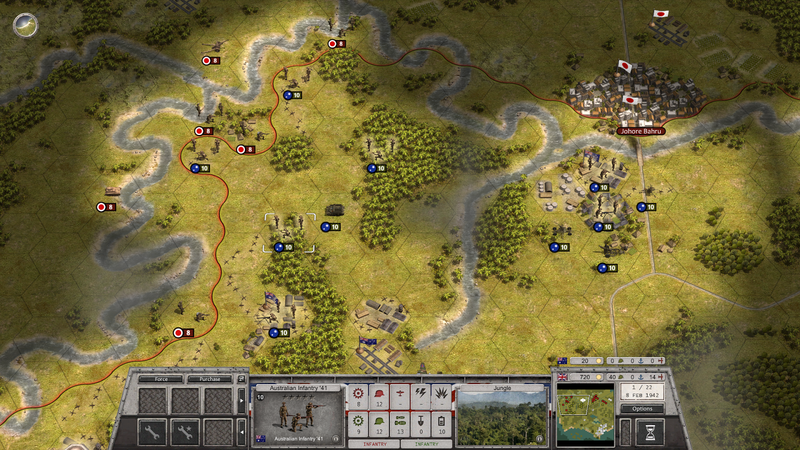 Order of Battle: Burma Road is the latest campaign add-on for the ever expanding Order of Battle family developed by The Aristocrats. Earlier this year I reviewed OOB: Kriegsmarine, which saw the player take on another side of the war not seen too often in wargames. Although Kriegsmarine was forced by practicality to move from historical naval actions to fictional Nazi pipe-dreams rather quickly, this new DLC featuring the British Commonwealth forces is loaded to the brim with historical, yet often forgotten, battlefields. Although I consider myself a WW2 history buff, I must admit that this theater was one I knew almost nothing about going in. I knew the British had to fight throughout the region to defend India and other holdings, but I couldn't have named a single important battle. Imagine my surprise when halfway through the campaign I take a break from fighting off the Japanese to visit Bombay where I'm tasked with tracking down and arresting Ghandi! Not the kind of thing you expect to see in a wargame. However, I enjoyed the change of pace, and the history lesson attached. 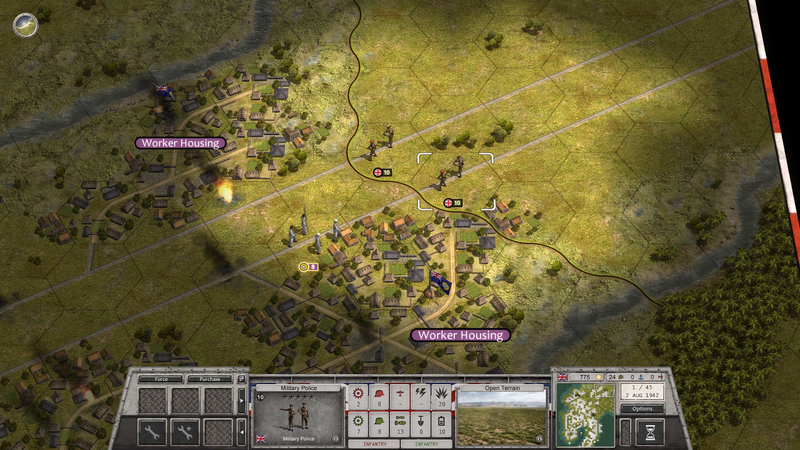 Unlike some of the other campaigns, Burma Road doesn't seem to add many new features to the overall game structure. The only significant difference I noticed was a more extensive use of friendly AI units than I've seen in the other campaigns (though I haven't played them all just yet). This fits thematically, since the Commonwealth forces were made of units from many different nationalities. Your core of British regulars will often find themselves fighting alongside various colonial forces, sometimes under your direct control, and sometimes not. You can also add some of the weaker colonial infantry to your core units at a cheap price, or get a nice splash of flavor by adding a unit of Gurkhas to your team. There are also SAS and SBS units to unlock, and all the British machines of war you know and love: Spitfires, Crusaders, and heavy artillery are all on tap. While this campaign does not shake up the core gameplay much, the scenarios available should please any fans of previous OOB installments. The rough terrain of southeast Asia makes for a tricky battlefield where putting units in the right positions is key to making them useful. Jungles, swamps, and hills are prominent on many of the maps, which can make even a large battlefield feel rather cramped. Frontage becomes a critical issue and you will not always have the option to make a flanking maneuver, unless you are willing to send a unit through the jungle, which may reduce its cohesion. You can, and must, use this to your advantage as well. 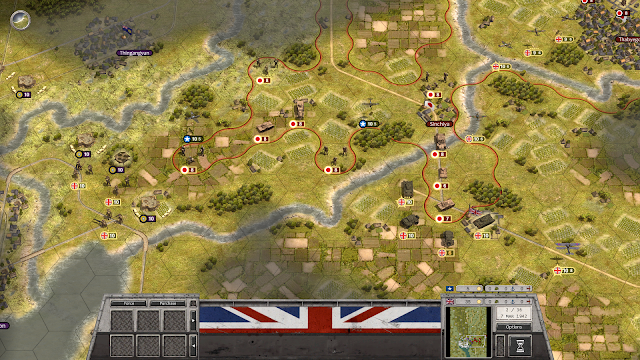 In many of the scenarios you facing an onslaught of Japanese units that outnumber your troops. Setting up a line of defense on tactically smart ground will keep your boys in the fight longer, and save resources for upgrades instead of replacements. I found the actual objectives of the missions to be varied and interesting. Most missions will start you off with one objective, then throw some new twist at you midway through. Your decision will usually be to determine what share of your forces you want to dedicate to different sections of the battlefield. It's not uncommon to be defending in one area and attacking in another. Given the heavy amounts of jungle on most maps, you will also want to send out fighters and scout cars to do reconnaissance when you can spare them. Fighting every enemy unit is usually not necessary, and it can make more sense to maneuver around difficult spots to complete your goals with minimal losses. This campaign is focused primarily on ground and air forces, with naval units only making occasional appearances. I found that ruling the skies was always very important, if not particularly challenging. The Japanese have some deadly tactical bombers that will inflict a lot of casualties on your forces if you don't take them down quickly. This is pretty easy to accomplish though, since your Spitfires and Hurricanes can make quick work of the Japanese fighters and then go after the bombers. You can also pick up some experienced squadrons by completing bonus objectives. One is the American Flying Tigers, which can be added to your force to make it even more culturally diverse. Overall, I found this to be a solid addition to the Order of Battle line up. While it doesn't shake things up too much, it takes a proven formula and uses it to explore a less well known section of the war. No one would have been shocked if The Aristocrats had visited the old standards like Normandy, Barbarossa, or Bastogne first, but I'm glad they are taking the road less traveled. This game play, if you are the type who enjoys it like me, is perfectly suited to tackling so many small and medium sized sections of the war. A North Africa and Mediterranean campaign would fit it like a glove, for example. Final verdict: keep the campaigns coming, I think this game still has a lot of room to grow. Mike Sandbagger Norris DFW T28 build!